My Mum’s cousin by marriage, Rosie, loaned me her beautiful sari or saree. Her sari is dark magenta and beautifully decorated in gold at the tail end. I love the colours, patterns and textures in Indian saris and as I had heard that it was the Hindu New Year at the end of March I thought I’d ask my friend and fellow Soprano Olga Ivankina to take a couple of photographs in the sunshine in Glasgow Mid-March for Pascal Barnier to use in a New Year celebration picture. I checked on-line how to wear the drape; it is typically wrapped around the waist, with one end draped over the shoulder, baring the midriff. The fitted upper garment called a blouse or choli has short sleeves and is cut off at the midriff. The sari is associated with grace so I tried to get some graceful pictures. I tried to wear the sari in the Nivi style but I need more practise. The cloth is wrapped around the lower body once, and then hand-gathered into even pleats below the navel, the pleats are then tucked into the waistband, in my case my leggings. The effect is meant to give a decorative effect which poets have likened to the petals of a flower. Whilst reading articles on India and it’s festivals I learnt that New Year is celebrated at different times from March 31st and throughout April dependant on the region and its cultural heritage. I would love to find out more and if you can help me out please add your comments to my post. Rosie originates from Hyderabad, the capital and largest city of Andhra Pradesh, South East India. I discovered Hyderabad is situated in south-eastern India 973 miles south of Delhi, 434 miles southeast of Mumbai and 350 miles North of Bangalore by road. It is one of the largest metropolitan areas in India. Hyderabad is situated on the banks of the Musi River and has a population of 6.8 million the fourth most populous City in India. The nickname for Hyderabad is ‘City of Pearls’ as it was historically known as a pearl and diamond trading centre. It’s situated on hilly terrain around artificial lakes. Industrialisation in the 20th century has attracted major Indian manufacturing, research and financial institutions. It is the fifth-largest contributor to India’s GDP. A city rich with history and tradition, Microsoft and Google have their Indian headquarters there. South Indian music and dances such as the Kuchipudi and Kathakali styles are popular in the region. North Indian music and dance gained popularity during the rule of the Mughals and Nizams. The nobility liked to associate with artistic courtesans called “Tawaif” whose role was to teach and promote singing, poetry and classical dance without the court. Music still plays an import part in the city’s culture and alongside western and Indian popular music genres such as film music, the residents of Hyderabad play city-based marfa music, especially at weddings, festivals and other celebratory events. The state government encourages the development of music by organising the Golconda Music and Dance Festival, the Taramati Music Festival and the Premavathi Dance Festival. 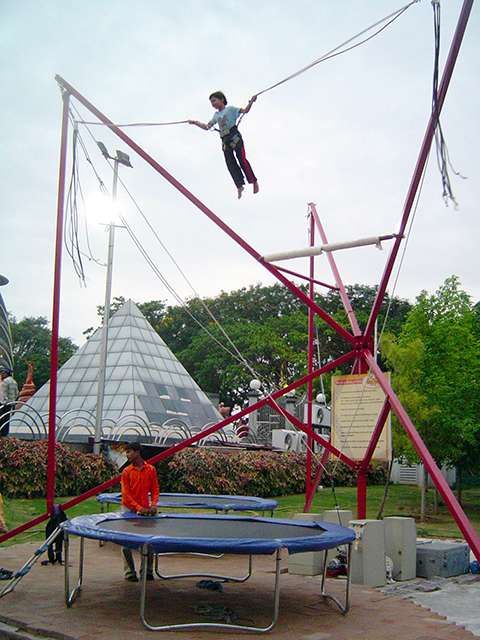 I could not resist adding this picture to close my post today as it reminded me of the time that I was talked into having a go on one of these reverse bungee trampolines by my brother, NEVER again 🙂 This one was at NTR Park and gardens in Hyderabad . The sari is gorgeous and you wear it well! You look lovely in that color. Wonderful photos about India and its history. Thank you Janice, I didn’t really know much about India and when I met and worked with students from the Chennai Conservatoire at the Celtic Connections event I looked up where they came from and saw their lovely photographs it made me even more curious. Thank you for offering to create the lovely Indian New Year picture for me. I’m so pleased my Nana suggested asking Rosie if she had a sari that I could borrow. Olga and I had a fabulous time taking the photographs in a Glasgow park which certainly turned a few heads lol. It was a pleasure to work with you photos made ​​by Olga …. In the end, everyone of them have fun on this project is a very good thing! Very pretty, Charlotte,, you look beautiful. It was fun learning more about the Indian culture, too. My brother-in-law is Indian. Thank you Deanie, where in India does your brother-in-law originate from I’m slowly learning where different cities are. Eastern Princess of fairy tale … it would go with both! There must be an opera in that idea 😉 If not perhaps we should create a new one with a blonde princess called Charlotte. Thank you, I’d like to keep the sari it’s so beautiful. When I first opened the length of cloth I thought ??? how on earth do you wear this. Wonderful post, beautiful sari and really enjoyed the writing about India…such a wonderful place. It’s definitely on my bucket list of places to visit and sing. Have you visited India, I’d love to see your photographs? Yes I thought that too Noony, very creative. Ha ha ha, we really should have had a sing song on that hill too, the flower duet with Olga and I full pelt. There were quite a few Scots turning around to see what we were up to. You look good with sari! Thank you, I loved wearing it. In fact I’d like to get a couple of the tops to wear with shorts in the summer. It looks exciting Arti and it was for the first bounce, but when I started getting higher and higher in London and could see over the top of Covent Garden my family thought I was screaming in enjoyment but it was pure fear. Glad you enjoyed the post I enjoyed learning about where Rosie was from. Hi dear. You look stunning in saree and being an Indian I feel great to see you respecting our culture! Lovely photo! And I love those trampolines, LOL! Every time I see one of those bungee trampolines my knees go to jelly 🙂 ha ha you should so work with a sari, they are the most lovely colours and textures. Thanks Lucy, it did feel really good wearing it, we had good fun. I haven’t visited Gaurab but I’d love to, both to visit and to sing there. If I make it, I’ll definitely take you to experience the trampoline jump (but be warned it’s terrifying). I loved wearing the sari, I found it quite empowering and I’m such a show off I loved standing out. You look great in a Saree, Charlotte. The first photo looks like a bouquet of flowers!! You are right in that different areas of India have their New Year on different days. – Tamil nadu state(capital Chennai, south of Hyderabad) celebrate new year which falls on April 15 and just know as “Tamil Puthandu” literally meaning Tamil new year. – Malayalam(Kerala state, Thirvananthapuram capital) call their new year “Vishu” and this year I believe falls on 14 April. Apart from Maharastra in the the list above, which is a western state, the 4 southern states make up 20%of the land area and again about a fifth of the population of India. I cannot remember off hand about the northern/western/eastern states new years…. I hope some one from the regions among your readers would enlighten us. Beautiful sari and really nice post. It was so much fun putting on the sari and taking the photos and then going back and reading about the festivals and celebrations. We really do live in a world rich in diversity and culture and making new discoveries can be quite exciting. One day I would love to visit India and see some of these wonderful places and maybe get the chance to perform there. Sounds like a wonderful idea. Especially performing there–maybe a professional cultural exchange? Love the creative graphics! You do look lovely in the magenta coloured sari as you have a fair complexion, Charlotte. Interesting post. 🙂 Kind regards, Iris. Most big cities in India, especially those which tend to get a lot of tourism, celebrate New Year’s Day on January 1st like most western countries. In Delhi, NYD used to be celebrated on the 1st of March and I believe still might be by more traditional Hindu families, but it is no longer the official beginning of the New Year. Thanks for the information, I do hope that as western culture spreads that local traditions and festivals do not get forgotten as they play an important part of what made a particular area or region unique. Beautiful! You wear it very well, I can’t say the same for me 😛 You have covered a lot in your short post, well done! That’s really nice of you. 🙂 Yes, there are numerous varieties with different price ranges. Good luck! Sweet. I love your sari and the collage. 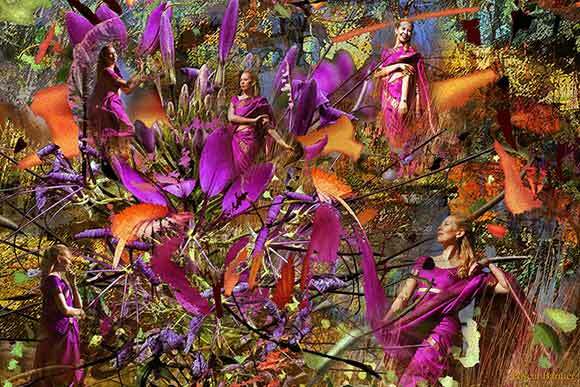 Thanks Jeff, the colours and composition in Pascal’s collages were fabulous. Many thanks for your visit to my blog. The colour you call magenta (or purple) is my mothers favorite colour and she has many scarves, gloves, dress jewelry pieces and even a summer hat using the colour. But I think that at the age of 82 she may baulk at a sari! I love purple too Kevin, one of my favourite monologues is called ‘When I am an old woman I shall wear purple’ by Jenny Joseph. Sadly I’m not a great cook, although I do try, I melted a feather cut of beef completely away last week in my slow cooker (lovely gravy though lol). Thank you, it was great fun to wear the sari and to read a little about the Indian culture and traditions.